Coalition partners ask about a temporary moratorium on power plants in the Town of Ulster to review zoning code, as they did on Solar Energy Systems last September. TownOfUlsterCitizens.org will deliver a copy of the letter with signatures from residents at the Town of Ulster’s next Town Board meeting on August 16th. An action for communities who are vulnerable in the “G” Zone (living in an attainment area that includes upper Orange, Ulster, Dutchess and Greene counties) will be led through steps to encourage their municipalities to shore up their zoning for peak energy plants that are 25mw’s or less at tonight’s public forum. All materials, including video from today’s event, will be provided as a tool kit to be shared. We write to you to ask for clarity on whether the Town of Ulster Zoning Code (the “Zoning Code”) currently regulates gas-fired power plants, and specifically request a statement as to how the Town is treating the proposed Lincoln Park Grid Support Center (the “Project”) under the Zoning Code. The applicant for the Project, Lincoln Park GC, LLC, (the “Applicant”) has stated that the project can be built as-of-right in the Office and Manufacturing District (“OM District”) because it is a “utility company structure”. Our interpretation of the Town’s Zoning Code differs, and we do not read the Code to permit gas-fired power plants as-of-right within any zone in the Town. We ask the Town Board and Building Department to clarify whether the Code regulates gas-fired power plants such as the Lincoln Park Grid Support Center, and if so, whether such power plants are permitted as-of-right in the OM District. The Project is proposed to be located on an approximately four-acre portion of a 120-acre property in the Town of Ulster. The property is primarily zoned as an OM District with a small portion of the property on which the plant would not be constructed located within the R-30 Residence District. The Zoning Code permits “utility company structures” as-of-right within the OM District. The Zoning Code does not include a definition of “utility company structure”. Nor are power plants or electric generation facilities discussed as possible uses within any of the districts under the Zoning Code. It is notable that under the Zoning Code, “utility company structures” are permitted within any zone within the Town of Ulster, with the sole exception of the Traditional Neighborhood Development Overlay District. Utility company structures are permitted as-of-right in the Highway Commercial, Regional Commercial, Office Manufacturing and Industrial Districts, and with a special use permit and site plan approval in any other zoning district within the Town (the Residential-60, Residential-30, Residential-10 and Local Commercial Districts). It is extremely unlikely that the Town intends to allow power plants, with their heavily industrial character and significant health, environmental and quality of life impacts, to be permitted within even the most restrictive residential district in the Town. The Zoning Code must also be read in the context of the Town’s 2007 Comprehensive Plan (the “Comprehensive Plan”) adopted pursuant to Section 272-a of the Town Law. The Comprehensive Plan recommends adoption of a “Ridge Protection Overlay District” that would include the area of the Project. The Comprehensive Plan urges additional land use regulations to conserve the ridgelines in the Ridgeline Protection Area and their natural environment and scenic vistas. While this zoning has not yet been adopted, it is still necessary to consider that the area of the Project has been identified in the Comprehensive Plan as especially valuable for its natural and aesthetic resources and deserving of special protection. 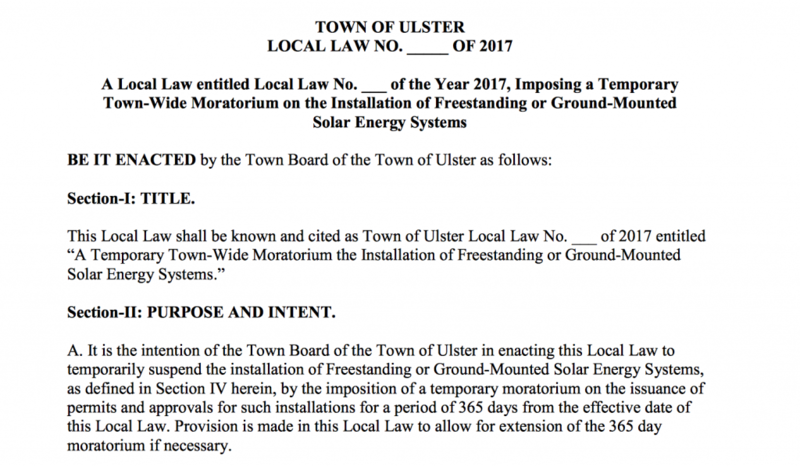 In 2017, the Town proposed a temporary moratorium on the installation of freestanding or ground-mounted solar energy systems. The Town’s stated rationale for doing so was that solar energy facilities are “not currently regulated in the Town of Ulster Zoning Code.” Therefore, a solar power generation facility does not, in the Town’s view, constitute a “utility company structure”. As both solar facilities and gas-fired power plants generate electricity, and a solar facility would very likely have fewer negative impacts than a gas-fired power plant, it makes no sense that a gas-fired power plant would be considered a “utility company structure” while a commercial solar facility would not. Therefore, we request that the Town clarify that the proposed Project is not an as-of-right permitted use within the OM District in the Town. Similar to its approach to ground-mounted solar facilities, we also urge the Town Board to adopt a temporary moratorium on construction of fossil fuel-fired power plants while it considers amending the Zoning Code to provide for specific regulation of such power plants. Because “peaker” plants such as the Lincoln Park Project are likely to become more common throughout the Hudson Valley due to the incentives created by the Federal Energy Regulatory Commission’s new capacity zone, and because these smaller plants are primarily regulated by local land use laws, it is important that the Town proactively identify which, if any, areas of the Town are suitable for such a use. Fossil fuel-burning power plants have unique impacts, including significant air emissions, noise, and visual impacts, and therefore warrant specific regulation within the Zoning Code to protect the health, safety and welfare of the community. We respectfully request a written response to our inquiries regarding the Town of Ulster Zoning Code’s regulation of fossil fuel-burning power plants and its specific treatment of the Lincoln Park Grid Support Project under the zoning code. See, e.g., Full Environmental Assessment Form Part 1 for Lincoln Park Grid Support Center, prepared by The Chazen Companies. Town of Ulster Zoning Map. Town of Ulster Zoning Code § 190-69. See Town of Ulster Zoning Code § 190-69. See N.Y. Town Law Section 273. See Town of Ulster Comprehensive Plan at 85. Town of Ulster Comprehensive Plan at 44. Greg Williams, Executive Director, Hudson River Sloop Clearwater, Inc.
Jessica Roff, Director of Advocacy and Engagement, Riverkeeper, Inc.
Hayley Carlock, Esq., Director of Environmental Advocacy, Scenic Hudson, Inc.
TOOLKIT AND VIDEO – Residents of Ulster County and ‘G’ Zone Counties: Temporary Moratorium on Fossil-Fuel Power Plants To Address Zoning.